Somewhere to be protected from the sun’s powerful rays but where the sunshine and light can still be optimised. Before building a conservatory or garden room it is worth discussing practical considerations with an expert and this should include factoring in the room’s use, the location, shade and ventilation. First and most importantly a homeowner should have a clear idea of the purpose of their conservatory and what activities will take place in the room and at what times of day. Is a computer to be used there? If so, it is essential that the sun’s rays do not shine in the eyes or on the screen. Is it used for morning or lunch time entertainment? For this, the room needs to stay airy and cool. It is also key to consider who will be using the room: young children, adults, pets etc – the more information the homeowner can feed to the designer the better the outcome will be. 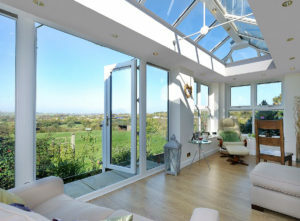 The location of a conservatory is paramount and can dramatically impact on the temperature in the room. A homeowner with a choice of locations available would do best to construct on a south facing outer wall to attract more sunshine. For homeowners with a south facing garden this is ideal and even in winter it will not require as much heating as a garden room in a garden that is north facing. Shade is imperative to keep a south facing conservatory cool and if you do not have the advantage of natural shade one solution is to apply high quality film to the windows. This works by not only reflecting the heat from the sun but also nearly all of the sun’s damaging ultraviolet rays – which is what causes the fading of furniture and carpets – therefore helping to keep your conservatory cool and your furnishings looking new. In the summer, ventilation is another essential consideration for keeping a conservatory/garden room cool. It is essential that air is able to flow through the building and that colder air can be drawn into the conservatory.